The rugged and foreboding Kimberley region of north-western Australia has a fearsome reputation for both its unforgiving environment and ability to draw adventure travellers from all over the world! The sheer cliffs, raging tides, carnivorous wildlife and inhospitable landscape effectively deterred the early 17th Century Dutch mariners from further exploration, but the region also holds what are possibly the world’s oldest known cave paintings – the Bradshaws or Gwion Gwion. 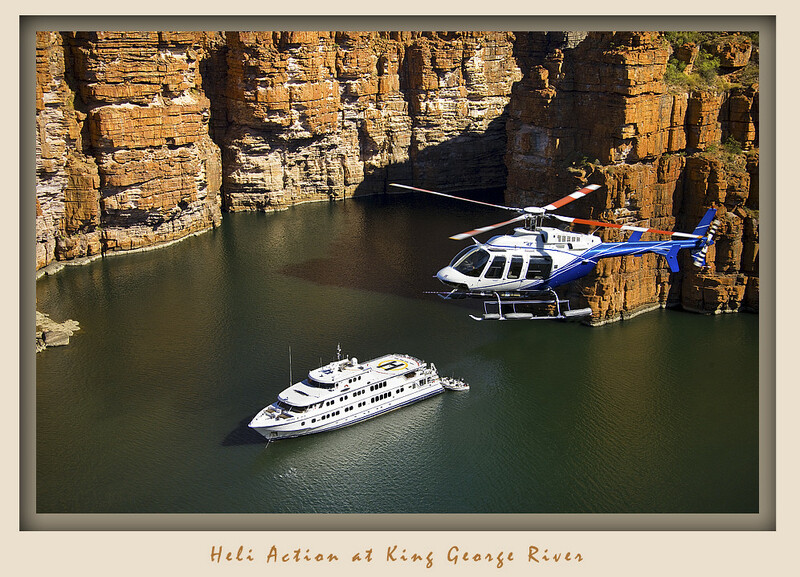 These factors have very effectively isolated the monumental rock formations and glorious ancient stone vistas from modern human interference, but thanks to the latest wave of sophisticated luxury expedition vessels, the Kimberley is rated one of Australia’s “must see” travel destinations. A secret well kept by expert fisherman, pearl divers and missionaries for most of the 20th century, the Kimberley is finally revealing its true wonder to the outside world. Just over one hundred years ago, white Europeans brought cattle to the Kimberley and if ever a harsh and unforgiving land epitomised the bush spirit of early European settlement, it is here. The Kimberley tolerates man’s presence but offers no comfort. Now that Baz Luhrman’s epic ‘Australia’ has swept the cinemas of the world, the Kimberley’s unknown status is forever lifted and thrust into the psyche of those that saw this ambitious spectacle. Fan of the film or not, there’s no glossing over the magnificent landscape! 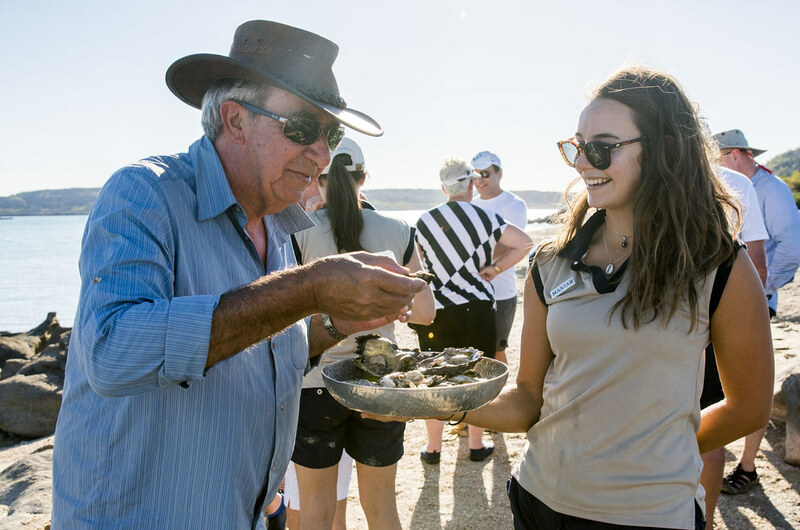 Between May and September every year, the multi-award winning True North conducts its acclaimed, naturalist-escorted tours throughout the labyrinth of estuaries, waterways and coves. Teeming birdlife, mysterious archaeological sites, awe-inspiring landscapes and natural phenomenon witnessed by very few Europeans are just part of the irresistible allure of Australia’s Kimberley. The Bradshaw Paintings: Believed by some researchers to be as old as 50,000 years, these intricate and detailed portraits depict a race of people long forgotten in the Kimberley. These contrast in style and design to the better known Wandjina paintings and have sparked many debates among experts. The Horizontal Waterfalls: Described by David Attenborough as "one of the greatest natural wonders of the world", this highly unusual phenomenon occurs as the huge, 10-metre tides ebb and flow between a tiny gap in the ridge within Talbot Bay in the Buccaneer Archipelago. Mitchell Falls. These superb cascades and their marvellous namesake plateau are perhaps the crowning glory of the scenic attractions of the Kimberley. Scenic helicopter flights are the best way to view these falls and are at their best early in the season. Montgomery Reef. This incredible “vanishing reef” reveals itself only at low tide in a spectacular display as cascades of water rush off rapidly exposed coral. Turtles patrol the channels by the dozen, enjoying the banquet. The adjacent bay has some of the country’s best whale-watching. Stand in awe as mighty humpbacks breach just a few hundred metres away. Broome. This isolated and remote township has come back to life as a bustling tourist centre and gateway to the great Kimberley region. From the iconic Cable Beach camel rides to pearling tours, the town is developing a world class tourism profile, yet retains its rugged, pioneering character. 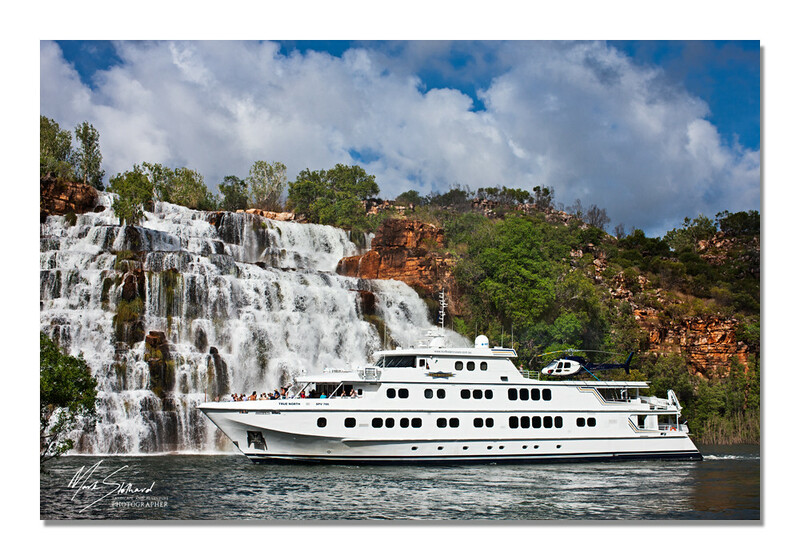 While numerous vessels conduct expedition journeys throughout the Kimberley, True North’s “Kimberley Wilderness Cruise” is the benchmark itinerary others strive to emulate. True, most first-time visitors are so awe-struck when confronted by the raw wilderness and out-of-this-world landscape, that any experience is life-changing. But North Star Cruises unmatched 20-plus years of cruising experience in the region gives them a decidedly unfair advantage. Their flagship, True North, is a purpose built, luxury expedition yacht carrying a maximum of just 36 guests and their trump card, a Bell jet helicopter, enables unprecedented access to remote locations including the top-secret Melaleuca Falls picnic and swimming spot, a genuinely unforgettable experience and a True North exclusive. Fisherfolk will be impressed at the incredible local knowledge and skill of the young crew, many born and bred in the region and expert in locating prime locations for that monster barramundi. Facilities: al fresco bar, lounge/theatre, dining room, observation deck and boutique. Scuba diving is offered on selected itineraries.